The Vermicomposting Center at Mayo Clinic Health System in La Crosse got a big boost recently when Honda Motorwerks donated a Worm Mobile to use for its composting program. The food waste disposal practices at Mayo Clinic Health System in La Crosse, Wisconsin, have gone straight to the worms. Literally. Instead of simply being dumped in a landfill, food scraps from around campus are put into five-gallon pails and hand-delivered (more on that later) to an army of hungry red wiggler earthworms. The worms then go to work turning the goods into high-quality compost that's eventually donated to local community gardens or sold. The whole thing started, we're told, a few years back when the University of Wisconsin–La Crosse received a grant to get into the vermicomposting game. Nearby Hillview Urban Agriculture Center also joined the effort, and together they purchased two large vermicomposters (aka, worm bins) and an equally large army of hungry earthworms to do the dirty work. There was just one problem: Nobody wanted the worms to take up permanent residence on their property. "For a long time, the vermicomposters bounced from location to location just because it's such a smelly, dirty operation," Cinthia Shireman tells us. "They'd find a new home, and then the fruit flies would come, and they'd get booted again." After growing tired of moving the vermicomposting units around, officials from Hillview approached Mayo Clinic Health System in La Crosse for help. The two organizations "have a pretty longstanding partnership," says Shireman, the sustainability coordinator at Mayo Clinic Health System in La Crosse. "And so we jumped in" to help. A heated garage on campus now serves as the Vermicomposting Center, the official home of the vermicomposters and their occupants. Shireman tells us Mayo Clinic Health System agreed to the gig because the request fell directly in line with Mayo's ongoing community wellness efforts. "It's also helping us reduce the amount of food waste that goes to the landfill," she says. "The Franciscan Sisters of Perpetual Adoration, who founded our campus, were also very much into protecting natural resources and the environment, and so we think this fits in with our Franciscan heritage and values as well." Though Mayo Clinic Health System in La Crosse houses both vermicomposters, Shireman tells us it's Hillview Urban Agriculture Center that "really runs the whole operation." Prior to last week, that operation consisted of students from UW–La Crosse using their own vehicles to transport buckets of food waste from their campus, Mayo Clinic Health System in La Crosse, and Western Technical College to the worms. (Now that's dedication.) "Unfortunately, that cut out a large amount of people that might have been interested," UW-La Crosse senior Jeremy Shimetz tells La Crosse's WXOW.com. Fortunately that's all in the rearview mirror now. Last Tuesday, as WXOW.com reports, Honda Motorwerks in La Crosse gave the program an electric boost when it donated a "Columbia Summit SMT-4 Neighborhood Electrical Vehicle" to help streamline its pick-up and delivery process. 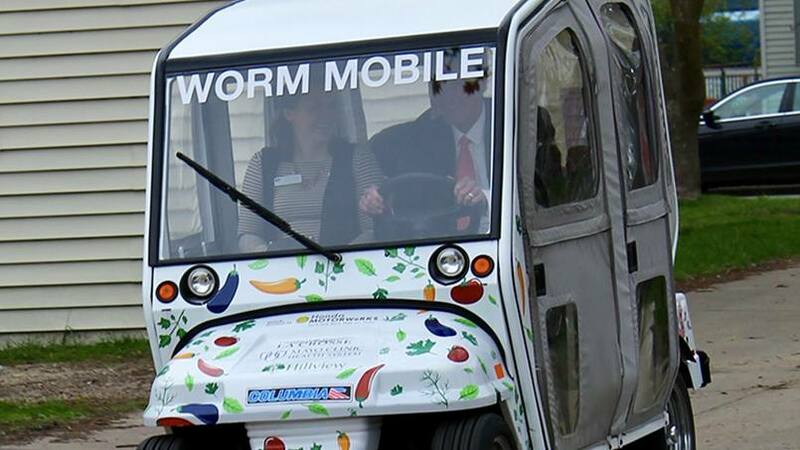 "It's been wonderful," Shireman says of the vehicle that immediately was dubbed the "Worm Mobile" by those who use it. "A lot of times, students' vehicles are unreliable or just too small to carry around these big buckets of food waste, so having this new vehicle for that specific purpose is pretty great." Worm your way into our hearts by sharing your comments below. Then, you can use the handy social media tools atop this page to share this story with others.